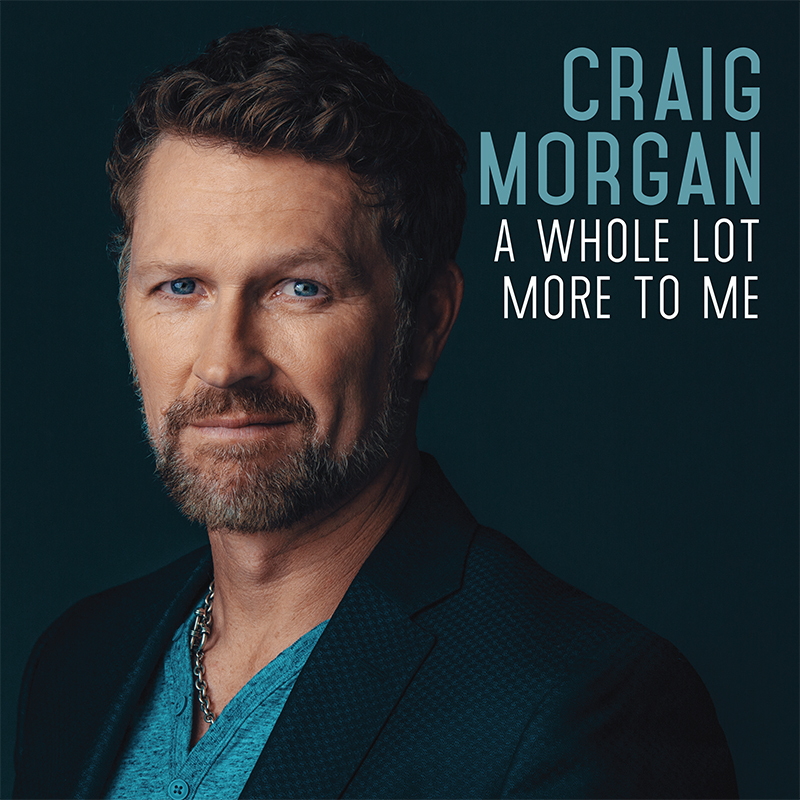 Saying there is a “whole lot more” to Craig Morgan is an understatement. The multi-faceted Renaissance man proves it on his upcoming new studio album, aptly titled A Whole Lot More To Me, a record that furthers Morgan's reputation as one of the genre's most commanding vocalists. While his singing on such hits as the multi-week Number One "That’s What I Love About Sunday," "International Harvester," "Bonfire," "This Ole Boy" and "Wake Up Lovin' You" was exemplary, Morgan has somehow found a new level and vocal range in the studio. On his forthcoming LP, his third with label home Black River Entertainment, he's making the most relevant, authentic and moving music of his career. It's a point that "When I'm Gone" drives home, as Morgan sings about living life with no regrets. "I’ve got a renewed energy with this record," he says emphatically. "In fact, I'm at the pinnacle of my career — producing, singing and touring. And this song epitomizes that. It's about living to the fullest, and when people hear it, I know they'll relate it to their own lives." His newest single, “I’ll Be Home Soon,” is an epic love song and one of many radio-ready hits on Morgan's highly anticipated project. He's written nearly half of the album's dozen tracks, and makes all of them his own. "I'm That Country" exudes Southern charm; "Remind Me Why I'm Crazy" showcases Morgan the crooner; "I Can't Wait to Stay" exults the joys of a small-town life; and "A Whole Lot More to Me" is a musical autobiography. The collection’s “When I’m Gone,” has already met critical acclaim with Music Row calling it a “powerhouse performance of a pile-driving song.” Each highlights his artistic renaissance. Morgan laughs at that word, however: "artistic." "I have friends who are very artistic people, sometimes oddly so, and I never wanted to be that guy, to be so artistic that I'm odd," he says smiling. "But it's good to know that I've evolved musically and, with this new record, I've created something with longevity." Indeed, Morgan's A Whole Lot More To Me, co-produced with Byron Gallimore (Tim McGraw, Sugarland, Faith Hill) and released via Black River Entertainment, is a timeless recording. As was their goal, Morgan and Gallimore, with whom he worked for the first time, succeeded in making music that will sound fresh a decade or more from now. These are songs that define a man. Morgan uses the honesty of the concert stage as an analogy for how he assembled what will be his seventh studio album. "It would look funny if you went to one of my concerts and I stood out there in skinny jeans. I'm not 21 years old, and I shouldn't pretend to be," he says. "But I also know this music will fit right in on country radio today. I'm singing music that is real and believable and at the same time relatable to all types of fans. That's hard to do, but you can do it if you stay true to who you are." And Craig Morgan knows exactly who he is, a man with many sides. Along with being an entertainer, he's an adventure junkie and hosts the popular Outdoor Channel series Craig Morgan: All Access Outdoors, entering its eighth season this summer. He's also a 17-year Army and Army Reserves veteran, a passionate champion of the military, a philanthropist and a celebrated motivational speaker. He’s a busy man with a knack for attention to detail. Carefully choosing each lyric on this album is no exception. There is not a single wasted verse — let alone word — on the follow-up to 2012's This Ole Boy. "Every word is valid and relevant on this album," he says. "It's a quality continuation of what I've done in the past." The most obvious bridge to Morgan's back catalog is the spiritually minded "Country Side of Heaven." The song is inspirational country at its finest, with a soaring chorus that at once elevates both listener and artist. "It has a very charismatic, inspirational vibe about it — but not preachy," Morgan says. "The energy feels spiritual by the time you get to the end and there is an emotional attachment within you that makes you want to hear it again and again." Morgan says the song, as well as album tracks like the emotionally charged “I’ll Be Home Soon” and the empowered-woman tale "All Cried Out," act as a through-line, a path for fans to connect the dots of his career: "You develop a fan base and they get acquainted with a certain thing from you, and they want that. This album is full of those." Another standout on the project is “Hearts I Leave Behind,” which features Morgan’s gritty and poignant vocals with the soulful Christian rock band Third Day’s lead singer, Mac Powell. The hard-touring artist has already been testing out the songs on the road, to stellar results. "When I'm Gone" becomes a call to action; "Country Side of Heaven" is an audience sing-along; and "Nowhere Without You," written by Michael McDonald, stands as an epic power ballad. "It's such an emotional song, one that I can see being played at weddings for a long time," he says. "I feel something in my chest when I hear it. It moves me — and that's what music is supposed to do." Especially in the hands of an artist as gifted as Morgan, who can effortlessly toggle between the breezy fun of radio staple "Redneck Yacht Club" and the poignancy of "That's What I Love About Sunday." He mixes both approaches in the album's standout track, "A Whole Lot More to Me." A smoldering, jazz-influenced love song with an everyman attitude, it shines a light on a different side of the artist, and country fans in general — one that likes a fine Cabernet as much as a cold beer, and indulges in sushi by candlelight as regularly as barbecue by the bonfire. "As a country singer, we sometimes get stereotyped as nothing but trucks and tailgates, but that doesn't mean that's all there is to us," he says, summing up the album. "I want people to hear this record and go, 'Wow, there is a whole lot more to these country folks.'" And in Morgan, those folks have no better messenger.